Winner of the 2014 San Diego Book Awards for History and Politics. "...only a small fraction have become aviation classics. 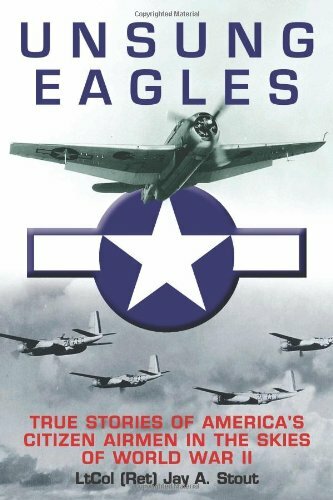 One is Jay A. Stout's, Unsung Eagles, the finest compilation of first-person accounts of what it is like to go to war in the air that this reviewer has ever read." "...crisply written book. It is an engaging history that gives a personal context to the great air battles of Of World War II." The nearly half-million American airmen who served during World War II have almost disappeared. And so have their stories. In Unsung Eagles, award-winning writer and former fighter pilot Jay Stout has saved an exciting collection of those accounts from oblivion. These are not rehashed tales from the hoary icons of the war. Rather, they are stories from the masses of largely unrecognized men who―in the aggregate―actually won it. The combat careers of 22 different pilots from all the services are captured in this crisply written book which captivates the reader not only as an engaging oral history, but also puts personal context into the great air battles of World War II.